Heat oven to 400°F/200°C/180°C Fan. Run a sharp knife along the back of each prawn and remove the intestinal vein. Add oil to a non-stick sauté pan and gently sauté the shallot and garlic in the oil for about a minute. Do not let them colour. Add the stock, and tomato puree, and bring to a simmer. Meanwhile put the tomatoes in a small oven proof dish, sprinkle the with oil and salt, and bake in the oven for about 10 minutes. Set aside for use as a garnish. After the sauce has simmered for 20 minutes, taste it  it should be quite prawny in flavour. Strain off the stock; put it back in the pan. Reduce it over a medium heat until there is about 300ml of stock left. At this point start cooking your pasta. Add the prawns and sauté for a minute or two until cooked. Keep aside the 4 big ones with the tails on for use as a garnish. Add the cooked prawns, courgette, and red pepper mixture to the sauce, and heat through. When the pasta is ready, drain and put into individual bowls. 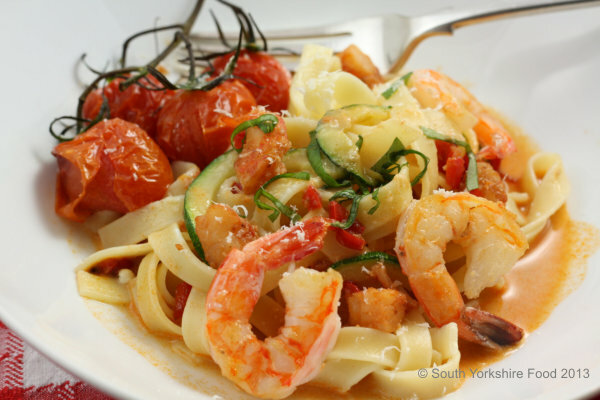 Spoon over the sauce, and garnish with the tomatoes, large prawns, basil and grated tomato.